HubSpot vs Infusionsoft: Which is the Best Marketing Automation Software? Today, there are tons of options in the market when it comes to choosing an all-in-one marketing software. Choosing one by comparing numerous solutions can be a daunting task, especially when you need results to show up faster. Hubspot vs Infusionsoft: Both marketing automation providers offer you all the necessary features. Each of them helps you execute your marketing strategy effectively and enables optimization of your online presence. But they are also significantly different. HubSpot is more focused on providing a platform for the integration of marketing and sales with easy to use tools for optimization and analysis. Whereas, Infusionsoft is centered on a relatively small CRM, but with ecommerce capabilities that are superior to those of HubSpot. Though both the software companies focus on different target audiences, the interface and features that they provide are not so different. Any new tool needs you to be trained accordingly. If this is taken care of, then you’ll find both the platforms easy to use and highly intuitive. HubSpot and Infusionsoft both offer content marketing tools for the design/creation of forms and landing pages. You can publish/schedule social media posts and manage accounts using both the platforms. Lead scoring is one of the most important features that marketing automation software should provide. Both lead management softwares offer this solution. Both platforms provide solutions for email marketing like list segmentation, campaign execution, designing templates, nurturing functionality, insights, and analytics. Both HubSpot and Infusionsoft softwares offer integrations and extensions, both free and paid, which can be found in their respective Marketplaces. Hubspot earns kudos for offering a fully integrated content management software that has a blogging tool, which would make it easy for you to create/publish content and website design without actual coding. This feature is not provided by infusionsoft. Infusionsoft also provides eCommerce features like the shopping cart and order forms. HubSpot lacks here. But you can integrate your eCommerce site into HubSpot with the help of HubSpot App Marketplace. Hubspot tool allows you to create and publish smart content like CTAs, templates, and smart fields on forms. Smart form fields help your leads to download your offers easily and these fields are not seen to those who have already filled it out. The more advanced your package is, the more training and support you’re going to need. HubSpot offers you a dedicated training and onboarding in all its plans. It may vary depending on the price and strength of the package though. HubSpot also has a consulting team that focuses on the success of their eCommerce customers. Infusionsoft offers a 30-day training program for all its packages. Infusionsoft will help you setup your first campaign. You can also choose paid gold or platinum plans or additional packages for further campaigns. 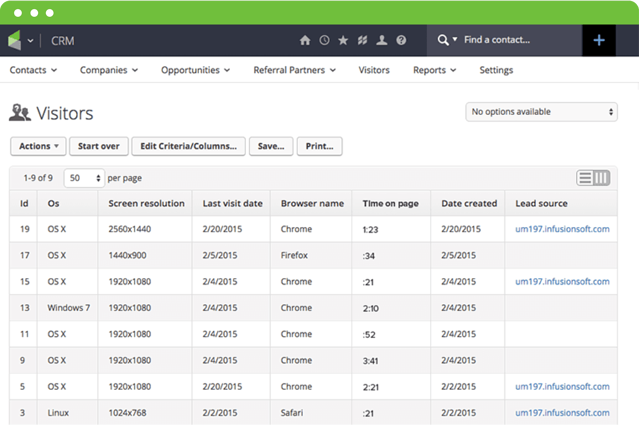 Infusionsoft offers CRM for small businesses and helps you to integrate your sales and marketing in one place. HubSpot has its own CRM tool but also allows you to integrate the marketing automation tool with your current CRM. HubSpot Marketing Pro and the HubSpot CRM, along with Sales Pro, offer built-in analytics and reports on marketing and sales performance. Infusionsoft offers all this within the CRM. With respect to eCommerce, Infusionsoft offers built-in billing and reports for sales, payments, revenue, receivables and other reports. HubSpot provides a free version of its best marketing automation tools for small businesses and beginners. The paid version starts at $50 per month. Their basic package which covers most of the features is for $200 per month. Infusionsoft doesn’t provide free version and starts at $70 per month. Both the vendors provide different onboarding options. Infusionsoft's most popular onboarding plan is at $1,999 and HubSpot's onboarding plan starts st $600. If you study the HubSpot versus Infusionsoft marketing automation comparison carefully, while being cautious about your business goals, then I’m sure you’ll rightly find out which marketing automation software is the best for your business. If you need to compare Hubspot and Marketo, read this - The Ultimate Face-off: HubSpot vs Marketo Marketing Automation. Need assistance in the decision process? Connect with our marketing experts at Prodigitas, who’ll help you take a well-informed decision by taking into consideration various aspects like your business type, buyer persona, pricing, sales and marketing integration, analysis, reporting etc. HubSpot versus Vtiger: Everything You Ever Wanted to Know About!